Many of us on the Production Expert Team have hybrid recording studio setups. We like to work "In The Box" in the digital audio domain but we also love to use our analog outboard gear. Hybrid studios enable us to harness the power, convenience and pristine sound quality of modern Digital Audio Workstations while also integrating characterful analog outboard gear such as tube EQs, multi-effects units and dynamic processors. Working in a hybrid setup though does sacrifice some time-saving conveniences that digital audio workflows offer, however, there are some Pro Audio brands that have taken note of the modern hybrid studio trend and have developed some products that either cater specifically to this market or solutions that help hybrid studio users in their day to day workflows. In this article we list a handful of products and solutions available today that help us to bridge the gap between DAWs and analog studio outboard gear. If we have missed any products that you feel bridge the hybrid gap between DAWs and analog outboard gear then please share them with the community in the comments below. Waves Q-Clone is a very powerful and simple plug-in that is definitely worth a mention in this list of products that bridge the gap between outboard studio hardware and the digital audio domain. In short, Q-Clone enables users to model their outboard EQs by use of two plug-ins called Q-Capture & Q-Clone. Q-Clone enables users can have several instances of a single outboard EQ across multiple tracks in a session... all with different EQ settings. Say you have a single channel outboard EQ unit that you want to use across multiple tracks, such as a lead vocal, bass guitar, snare drum and kick drum. You don't need to go out and buy three more EQ units, nor do you need to print your tracks, instead you can use an instance of Q-Clone on each of the tracks you want to EQ along with a single instance of Q-Capture on an aux track and hey presto... you've quickly expanded the use of your single channel outboard EQ. It's magic! 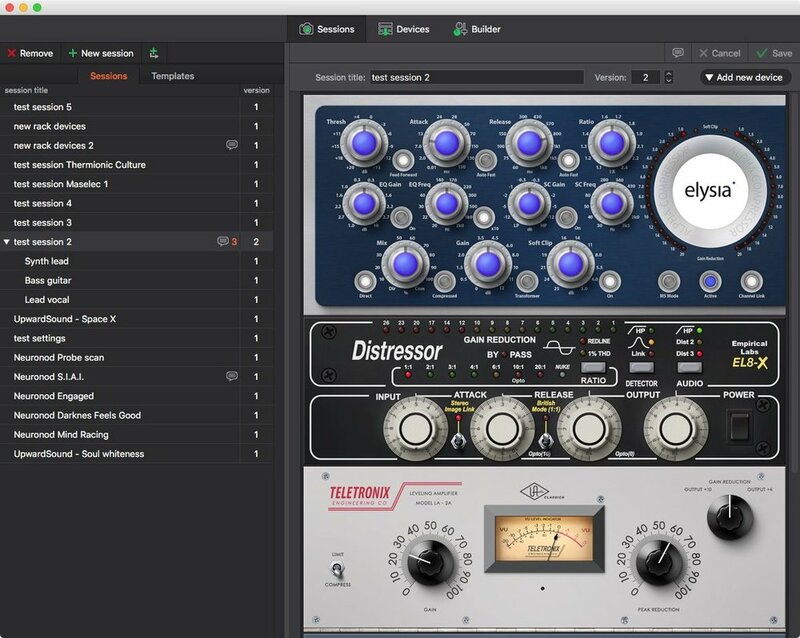 Watch our free video tutorial below to learn how to setup Q-Clone using the Q-Capture plug-in and to see Q-Clone capture the EQ curves on a single outboard EQ. Visit the Waves website for more information about Q-Clone. No-one enjoys jotting down analog outboard settings as it takes a lot of time and it isn't always precise. Snapshot does away with the pencil and paper! Got the perfect settings on your vintage 1176 compressor for a lead vocal track? Snapshot it. Got a guitar amp setting you absolutely adore? Snapshot it. Want to recall a microphone set-up on a drum kit? Snapshot it. Snapshot is a simple and genius idea. Snap a picture of your hardware settings on your phone, send it to your computer and save it within the session you are working on using the free Snapshot plug-in. Users can also add notes within the Snapshot plug-in. It's like a chinagraph for the 21st century. Session Recall is an application that isn't too dissimilar to Snapshot's. Session Recall is a free standalone application for Mac & Windows that features many popular studio outboard units in plug-in form, though these "plug-ins" are sold separately for reasonable prices under 5€ per unit in their Device Store. The UIs look almost identical to many outboard devices and these "plug-ins" also features movable knobs and dials, great for recall. Visit the Session Recall website for more information about this application. Tegeler Audio Manufaktur produces a range of very nice studio outboard channel strips, EQs and dynamic processors. In 2017 they released a free plug-in pack called Digital Recall Sheets that enable their hardware users to store Tegeler settings within DAW sessions. This Digital Recall Sheets pack includes plug-ins for all Tegeler Audio hardware units. The UIs of these plug-ins respond just like normal audio processing plug-ins. These are not emulations as they do not process any sound at all. Users can twist the dials, flick the switches and even save and load presets. Do you use Tegler Audio Manufaktur gear? Visit their website to download their free Digital Recall Sheets. Tegeler Audio also offers two outboard units that both feature motorized pots which enable users to automatically recall settings by use of a plug-in. The multi-compressor Schwerkraft Maschine and tube reverb Raumzeitmaschine both feature this technology which does away with the faff of manually recalling setting by connecting the hardware to a computer via ethernet cable and controlling the device via plug-ins. When a user preset has been loaded in the plug-in the devices quickly spins their pots to the exact position and voila - instant, and more importantly, effortless & precise hardware recall in seconds. Read: Should Studio Outboard Gear Have Plug-in Counterpart For Easy Recall? If you own a Bricasti M7 reverb unit then this plug-in by Exponential Audio is a must have. Exponential Audio worked closely with Bricasti Design to develop the M7 control plug-in which provides users with all the typical conveniences of a plug-in but controls the Bricasti M7 hardware reverb unit - how hybrid studio is that?! Watch Exponential Audios M7 Control walkthrough video below to learn how to setup the M7 hardware with the plug-in. If you feel we have missed any products that bridge the gap between DAWs and analog outboard hybrid workflows then please share them with The Production Expert Community in the comments below.